What was the first coin struck by the Denver Mint? Until now, we did not know. 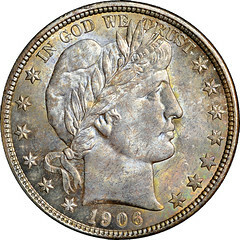 According to the research of ANS Fellow Kurt Baty of Austin, Texas, that initial issue was the half dollar of 1906. 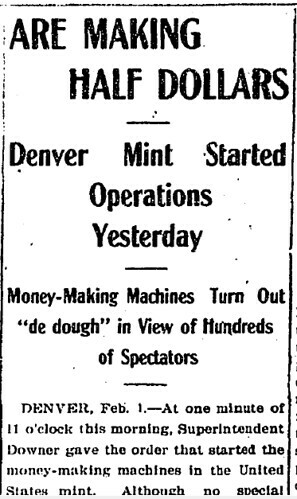 Although numismatists have long been confident of the histories of the main Mint in Philadelphia and six of the branch Mints, this detail from the Denver facility remained hidden. It came to light through an insightful Internet search of key words. In fact, it may have only been through the power of the Internet that this detail was discovered because it was never recorded by the Mint itself in any official reports. "It started with a rather simple question," Kurt Baty explained. "If I wanted to have a U.S. Mint mintmark set, what could it look like?" In other words, we have had eight U.S. Mints: Philadelphia, Charlotte, Dahlonega, New Orleans, San Francisco, Carson City, Denver, and West Point. How you choose to assemble a set of one coin from each Mint is up to you. We seem to know some official account which is generally correct for each of the other Mints. For instance, we accept now that the first coins struck under the authority of the main facility in Philadelphia were half dimes (spelled "dismes" back then). Similarly, it is well recorded that the first coins struck at the New Orleans branch were dimes: 1838-O Liberty Seated, Type 1, No Stars. The series that launched the Carson City Mint were "a few" 1870 Liberty Seated silver dollars struck on (or prior to) February 4, 1870. They were followed by a run of 2,303 on February 11. 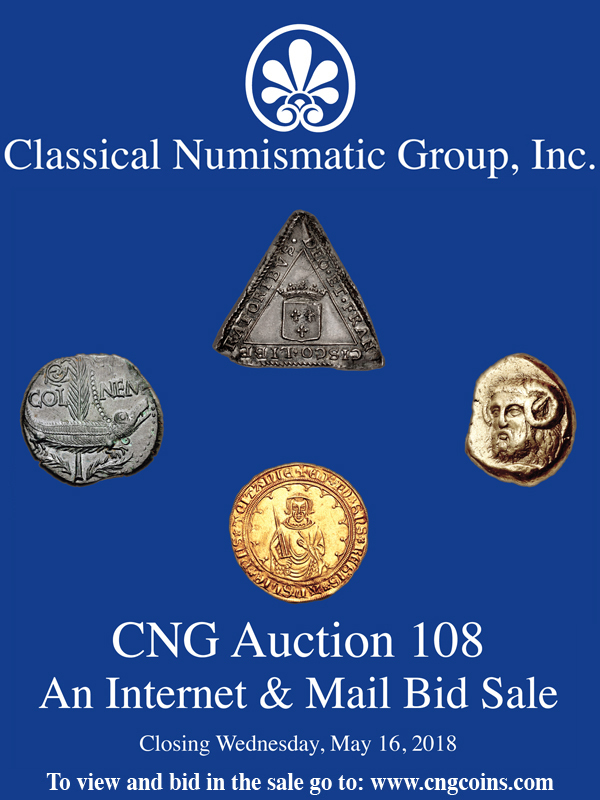 That fact was also not well known until the publication of the Stacks Bowers auction catalog for the ANA convention in Philadelphia August 7-11, 2012. The sales were held on the first two nights. 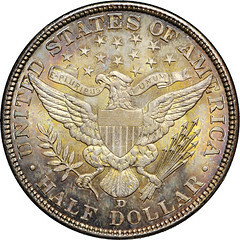 For the catalog, lot number 11077 was an 1870-CC Liberty Seated Silver Dollar, Variety 1-D, MS-64 (PCGS) in a secure holder. (It sold for $129,250.) For the lot description, the researchers at Stacks Bowers provided a full narrative citing newspaper reports from the Virginia City Territorial Enterprise for February 5, 1870 and the Carson Daily Appeal of February 6, 1870. That history was slightly modified in A Guide Book of The United States Mint: Colonial, State, Private, Territorial, and Federal Coining Facilities by Q. David Bowers (Whitman Publishing LLC, 2016). There, Bowers dates the first Carson City silver dollars from February 10. Finding the newspaper stories cited in the Stacks Bowers catalog, Kurt Baty pointed his browser's search engines to similar media for reporting about the Denver Mint. He struck pay dirt. At the website www.ColoradoHistoricNewspapers.org he found a story from the Aspen Democrat for February 2, 1906. "At one minute of 11 o'clock this morning, Superintendent Downer gave the order that started the money-making machines in the United States mint. Although no special ceremony marked the opening of the mint, the balconies above the stamping rolling, and adjusting rooms were packed with visitors who watched the fascinating work below. The day was given up to the making of half dollars. The silver had been received from the subtreasuries in St. Louis and Chicago, in the form of uncurrent and abraded coin, which had been found wanting, so they were melted into small bars for coinage. A noticeable feature of the machines is that each one has a separate motor; so that everything in the United States mint runs independently of everything else."